Mobile money services have encroached on almost all segments of our economy, in a latest move that will see Airtel Money users spend less 5 percent on purchases made from Chandarana supermarkets, it clearly shows how local organizations are eager to cash-out on this fundamental development. 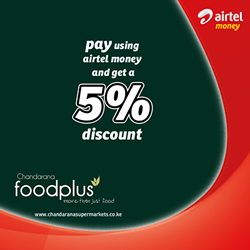 The Chandarana supermarkets have an online based store from which customers can make orders and pay with various payments options including Airtel Money. Besides a 5 percent reduction in the total price, customers will also have their orders delivered at home at their convenience. Unlike most parts of Africa, Kenya is far a head in mobile payments services with Mpesa enjoying a substantial customer base among phone owners in the country.